“Free-form radio will not die as long as I’m alive,” Larry Monroe told the Austin Chronicle in 1997. Thirteen years later, he signed off at KUT, which had cut his hours on-air and implemented a partial playlist. 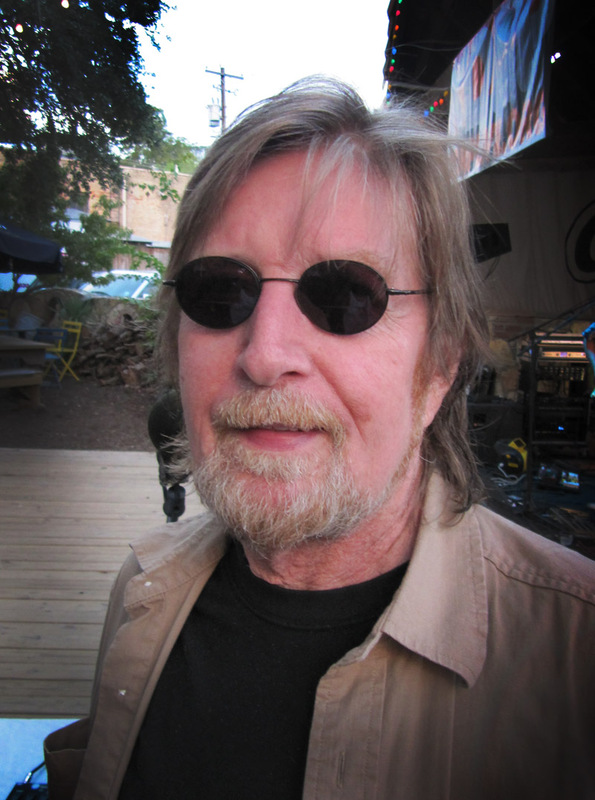 “I’m Larry Monroe, and I’ll see you in the future,” the DJ said at the end of his final “Blue Monday” on KUT on August 30, 2010. After 29 years at the station he moved on to KDRP in Dripping Springs for the freedom to play whatever he wanted to. Friday morning, Monroe signed off for good. He was 71. The beloved Austin music institution died after being admitted into the hospital with breathing difficulties. His last public appearance was Wednesday at Guero’s, where he hosted a live radio broadcast and struggled to announce the acts due to belabored breathing. For years, Monroe suffred from chronic obstructive pulmonary disease. Monroe was the king of the segue, expertly dovetailing songs into each other to create perfect radio themes. On his signature programs “Blue Monday” and “Phil Music” he crafted playlists like a true artist. A native of Indiana, Monroe attended Ball State University, where he had a friendly rivalry in the radio-televison-film department with David Letterman. Watching his former classmate’s career soar didn’t make Monroe jealous in the least. He was following the dream he had as a teenager making his radio debut as a high school basketball announcer. Larry Monroe lived to make a connection through music. He wanted to play something that the listeners would hold in their hearts and after so many years of that he became a piece of this town’s spiritual infrastructure. No one person has done more for Austin music. Not just for playing so much of it, but for serving as this town’s personal trainer for good taste in music. After KUT cut the hours of mainstays Monroe and Paul Ray, an organization called Save KUT put together “Twang Dang Doodle,” a three-club event to raise awareness of this homogenization of Austin radio. One of the highlights was a reunion of Two Nice Girls, whom Larry championed on KUT. Even more significantly, the DJ helped pull Laurie Freelove of the band out of homelessness and depression. He also did so much for Blaze Foley. So many instances of his generosity were recalled on social media Friday. Special programs on the nights that Doug Sahm and Townes Van Zandt passed away remain some of the most moving hours of Austin radio. Monroe provided solace and inspiration. He tried other jobs for a couple years, but returned to radio at a small station in Nashville. But because of his adventurous tastes in music, he kept hearing that Austin, then in the heat of the progressive country movement, was where he needed to be. In 1977, he got a job at KOKE-FM, which was radio ground zero for the cosmic cowboy movement. But within a couple weeks, the station’s format had changed to country hits. “My heart just dropped,” Monroe told the Chronicle in 1997. “My job had disappeared.” He bounced around a few Austin stations, but he finally got his dream job on March 1, 1981, when he was hired at KUT. Monroe’s encyclopedic knowledge of songs allowed him to perfect his segue (which he always spelled “Segway”) style of tying songs together. He never tired of soaking up as much music as possible and went out to the clubs almost every night after his shows. His famous streak of 444 consecutive nights of live music may never be broken. Like Clifford Antone, Larry Monroe did not just want to provide entertainment, but education and enlightenment. And Austin is a much richer place because of it. Kids learned about Muddy Waters and Woody Guthrie and Fats Domino because their parents played Monroe’s shows at home. He upheld a standard of music in this town. It’s not just for the background. It belongs deep inside. Monroe is survived by his girlfriend, photographer Ave Bonar, who he romanced late in life, and an adult daughter Sara. He’ll be buried in Indiana at a private ceremony. Plans for an Austin memorial are in the works. “Larry Monroe was the live music capital of the world,” someone wrote on Facebook Friday. A slogan that no one can deny. This entry was posted on January 17, 2014 at 10:14 pm	and is filed under Uncategorized. You can follow any responses to this entry through the RSS 2.0 feed. You can leave a response, or trackback from your own site. What a lovely article about a wonderful and influential man who gave Austin the best of his heart and soul. I still have a giant bin of cassettes recorded from his wonderful shows on KUT. Larry introduced us to sounds that changed our lives. Thank you Michael for the tribute. I loved Larry Monroe. He taught as much as he entertained. Austin is different now without Larry, Paul Ray, Clifford Antone and of course, others. I am grateful for this reminder of what a music sanctuary we had. Michael, your writing has always retained that same independent spirit. Thank you for that. There is a lot going on in Austin still, but I surely miss those glory days. I have known Larry since he first came to town and I was playing with Butch Hancock at the Split Rail. I attended his broadcasts at KUT studios more times than I can remember throughout the 80’s and 90’s. KUT was a very open environment back then. Before the “big terror” you could walk in off the street, any time, night or day. The sound of KUT reflected that openness and freedom. Larry’s shows blossomed in that freedom. His shows were a community beacon. He brought us together. Late at night driving back from a show in Houston or Dallas I would tune the radio to KUT and listen to the static until we got close enough to hear Larry’s show. to be pressed into service finding songs about fishing or…? I’m so happy I’ve been Larry’s friend. He was an inspiration, on air and in person. Still is.